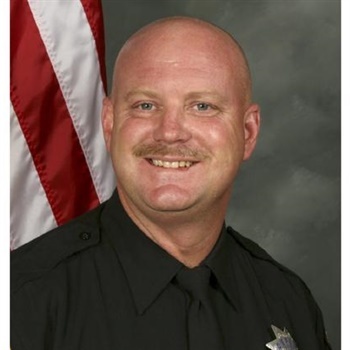 A Sacramento County Sheriff's Department deputy died after he and two California Highway Patrol officers were shot Wednesday, the Sacramento County Sheriff's Department reports. Dep. Robert "Bob" French, a 21-year veteran of the Sacramento County (CA) Sheriff's Department, died on his way to the hospital after being shot in the chest, according to Sacramento County Sheriff Scott Jones, reports CBS Sacramento. French was a training officer. He is survived by his live-in girlfriend, adult children and his grandchildren. The two CHP officers who were wounded are expected to survive their injuries. Three suspects were arrested in connection with the incident, which began Wednesday morning at the Ramada Inn in the 2600 block of Auburn Boulevard with a stolen vehicle investigation, said Sgt. Tony Turnbull, Sheriff's Department spokesman, reports the Sacramento Bee. A vehicle theft task force consisting of CHP officers, sheriff's deputies, and probation officers had gone to a hotel parking lot. Two suspects, both women, then led law enforcers on a chase about 10:30 a.m. that ended in the Laguna area, where the women were taken into custody, Turnbull said. Officers then checked on other possible suspects in a room at the Ramada Inn. When they knocked on a hotel room door, a man opened fire through the door and struck two CHP officers, Turnbull said. Additional deputies responded on the back side of the room. The male suspect, wielding a high-powered rifle, engaged in a shootout that injured a deputy. The suspect managed to get into a car and escape on Fulton Avenue. He turned onto El Camino Avenue and crashed near Watt Avenue. He then exchanged gunfire again with officers. He was struck and then arrested. The suspect and the officers were taken to area hospitals. Their condition was not known.